In the summer of 2004 Tiger Woods yacht named "Privacy" set sail from boat builder Christensen Shipyards in Vancouver, Washington. At 155 feet in length and an estimated cost of over $20 million US this megayacht is definitely in a class rarely matched. This baby is one of three ships of this size built by the esteemed Christensen Shipyards annually. Each one is identical save the interior. The idea being that a potential buyer who has little time to spare comes in when the Trideck Motor Yacht is about 60% complete and makes decisions regarding the finishing appointments. At 6,500 square feet there is plenty of room to roam or entertain a few of your closest friends. The interior is finished in dark cherry wood and beige marble. The furniture is leather upholstered with white silk walls and white carpeting. Of course there is a theater, eight seater Jacuzzi and a gym to keep Tiger buff while away from his home in Florida! So how many friends you ask? Well there are 6 staterooms and a massive master suite allowing a total of up to 21 guests. The ship has a cruising range of 4,300 nautical miles and is powered by Detroit Diesel 12V 4000. The Beam is 29'6" and the draft is 7'9". So now that you think Tiger Woods Yacht is something impressive (and it is), let's have a look at what the real wealth in the world cruises around on! In 2008 the top 100 private megayachts all measured over 206 feet! 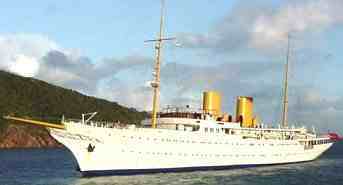 1) "Platinum" ...After Originally being commissioned in 1996 by Prince Jefri Bolkiah, who is the younger brother to the Saltan of Brunei, the yacht was mothballed due to the Prince's bankruptcy. Now owned by Sheik Mohammed bin Rashid al-Maktoum, the Crown Prince of Dubai, Platinum was launched in April of 2005 but is yet to set sail on her maiden voyage. At a gargantuan 525' this will be by far the largest of her kind in the world. 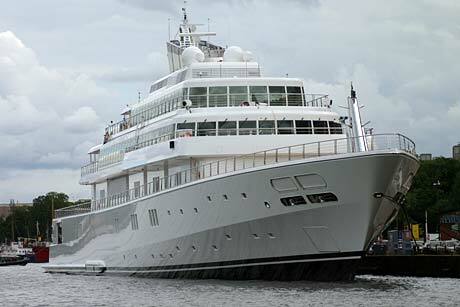 .... At a staggering 456'10" Al Salamah is the largest operational mega-yacht in the world. She is owned by the defense minister of Saudi Arabia, Prince Sultan bin Abdul Aziz. 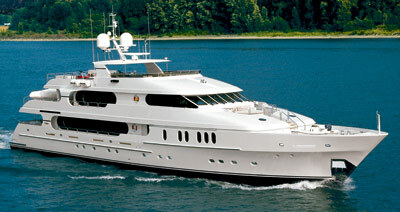 ...This monster measures a mere 452'8" and is owned by Oracle founder Larry Ellison. She was built in 2004 in Lurssen, Germany and is powered by 4 - 12,000hp MTUs. ...At 414' this megayacht is owned by Microsoft cofounder Paul Allen. ...This is truly a head turner. Built in 1931 this 408' beauty runs charters in the Mediterranean for weddings, birthdays and vacations.